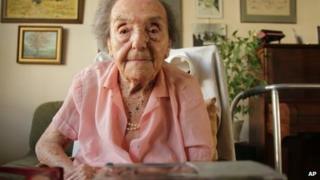 The oldest known survivor of the Nazi Holocaust, Alice Herz-Sommer, has died in London at the age of 110. Born into a Jewish family in Prague in 1903, Ms Herz-Sommer spent two years in a Nazi concentration camp in Terezin. She was an accomplished pianist and music teacher and taught at the Jerusalem Conservatory until 1986, when she moved to London. A film about her life has been nominated for best short documentary at next month's Academy Awards. "We all came to believe that she would just never die," said Frederic Bohbot, producer of the documentary, The Lady in Number 6: Music Saved My Life. Ms Herz-Sommer is said to have continued playing the works of Schubert and Beethoven until her final days. On the film's website, she says: "I am Jewish, but Beethoven is my religion. I am no longer myself. The body cannot resist as it did in the past. "I think I am in my last days but it does not really matter because I have had such a beautiful life. "And life is beautiful, love is beautiful, nature and music are beautiful. Everything we experience is a gift, a present we should cherish and pass on to those we love." Ms Herz-Sommer recalled "always laughing" during her time in Terezin, where she and other inmates put on occasional concerts. She said the joy of making music had kept their spirits up. "These concerts, the people are sitting there, old people, desolate and ill, and they came to the concerts and this music was for them our food. Music was our food. Through making music we were kept alive." In 1942, her 73-year-old mother had been transported to Terezin, also known as Theresienstadt, and then on to Treblinka, an extermination camp. "And I went with her of course till the last moment. This was the lowest point of my life. She was sent away. Till now I do not know where she was, till now I do not know when she died, nothing." Ms Herz-Sommer and her son, Stephan, were among fewer than 20,000 people who were freed when Terezin was liberated by the Soviet army in May 1945. An estimated 140,000 Jews were sent there and 33,430 died there. About 88,000 were transported on to Auschwitz and other death camps, where most were killed. Ms Herz-Sommer's husband, Leopold Sommer, whom she had married in 1931, died of typhus at Dachau, a Nazi concentration camp in southern Germany. Her son, who became a concert cellist, died in 2001. Ariel Sommer, her grandson, said: "Much has been written about her, but to those of us who knew her best, she was our dear 'Gigi'. "She loved us, laughed with us, and cherished music with us. "She was an inspiration and our world will be significantly poorer without her by our side."